Zoomax M5, the first handheld video magnifier in the global market adopting 2HD design - HD camera plus HD screen, presents super crystal-clear image for all age group. Being approved by hundreds of testers from low vision organizations, schools and individuals, its freely touch and handy features allow everyone to experience the cutting-edge device you'll never imagine. 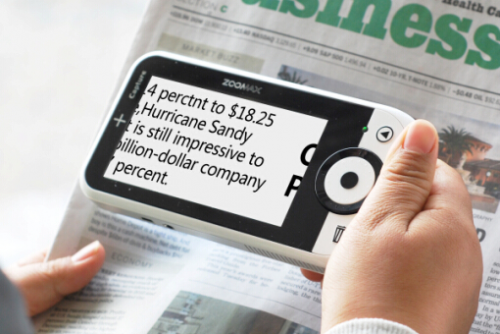 Treat yourself with the clearest image you've ever been offered on a 5-inch electronic magnifier. Zoomax unique 1280*720p screen resolution display creates incredible crystal-clear image and avoid motion blur for any age group. The sensitive HD touch screen also reduces eye strain and increase eye comfort. Utilizing two 5-megapixel cameras at a resolution of 1280*720p, M5 catches every detail of your reading material. The two cameras were designed in the center at the back for better positioning. 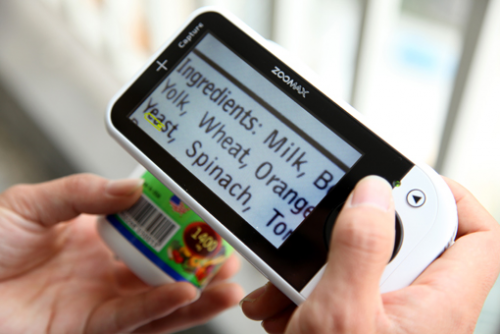 Through great customer survey on using experience and accessibility, Zoomax developed the first combined interface, adding the power of the touchscreen while maintaining the tactile buttons that are familiar to visually impaired users. Anyone who has ever used a video magnifier will immediately feel comfortable using M5 in traditional/familiar ways, and need only advance to use the touchscreen interface once they feel ready, especially for seniors. With "one-flick" design on M5's sensitive touch screen, color contrasts could be easily changed in a second. Users can freely flick in any direction to circle around the full color and contrast color modes to your specific needs. Panning is an extension of the viewing experience. When the image is zoomed in, press the screen and pan to view detailed parts of the photo. With the panning features and sharp image quality, one can manage to see very tiny details. Save up to 60 photos. To create the best image possible, M5 employs two separate 5-megapixel HD cameras for distance viewing and close/reading mode separately. It can be switched quickly and automatically adapting to the natural position of the visually impaired user. Elegant texture is embodied in design. Thinner than 1 inch (20mm), M5 is supremely slim and lightweight with a beautifully crafted body and a weight of just 9.35 oz. (265 g) for ultimate portability. M5 handle is a detachable handle specially designed for your M5. With fully ergonomic design, M5 handle is comfortable to hold and easy to use. M5 handle is a detachable handle specially designed for your M5. With fully ergonomic design, M5 handle is comfortable to hold and easy to use. Easy to be fitted and controlled, M5 Handle! M5 Handle is designed under human engineering standards. The width and length of this handle is base on human factors, it can be comfortably held for a long time in both reading and distance viewing. The notch design on the handle provides anti-slip and easy to hold features to reduce any accidental injuries. The original design concept of M5 handle is to meet the requirements of different handedness. The handle can be installed and rotated to the angles, you can select the most appropriate one when you are using it. When you are writing, this function could free your dominant hand to hold a pen. Weights only 29g. You can take it and use it anywhere. Aim the slot’s gap on the handle to the slot on the back of the unit, you can press to install the handle or you can detach it in the same position. Perfect combination of M5 and it’s handle is utterly natural.